In our fast paced, market driven culture you don’t hear a whole lot about gentleness. We rarely hear about this powerful principle with such a great promise attached to it, yet it is one of the most important principles you should know. Today the words meek or gentle have become synonyms to the word weak, and gentleness or meekness is anything but that. Let me give you a true definition of gentleness. Gentleness is strength under control. The Bible teaches us that real gentleness is not weakness; but rather it’s strength under control. We’ve all worked with, worked for, worship with, or maybe even lived with some of the edgiest people. You know, people who are so moody that anything can cause them fly off the handle. Quick tempered; quick to let somebody have it; cut throat; manipulative; do whatever to get ahead; or take what belonged to someone else. These characteristics does not denote strength. Instead, they symbolize weakness. A gentle person is not driven by their own emotions nor do they overreact off of any or every little thing. A gentle person is not irrational, unruly, or unmanageable. In fact, gentleness in the Bible was actually used to refer to a wild stallion that had been tamed. You could go out in the fields and hills and find a wild stallion who is strong and unbridled and has enormous strength, however they can kick you and kill you pretty quickly. But if you bring that stallion back and you tame it then the strength is brought under control. The strength is bottled up for the master’s use and now the stallion is useful. A tamed horse is no less strong than a wild horse. It has just as much strength and can go just as fast. But a tamed horse, a meek horse, a gentle horse is one that is strength under control. It is bottled up for the master’s use. Another Greek meaning for gentleness is to be humbled unto God; to have a mild disposition towards God and accepting to the way that He deals with your life. Meaning you accept the dealings of God with a decent attitude and without the dispute. It would do us some good to yield when God is after something in our lives; get out of the way and say, “Lord have your way in me”. We often times resist arrest causing ourselves and the loved ones connected to us to have to go around the same mountain over and over again. In the old testament the meek people were the people who relied on God to defend them wholeheartedly. They trusted in God. And God fought the battle for them. Today with all of the power, options, and liberties we have, we forget to remember that the battle is the still the Lord’s. With good intentions, we take on battles when sometimes it’s wiser to just sit back and let the Lord take over the fight. I’ve learned not to go after anything in my own strength. I have before, and was sorry that I did. Sometimes you have call yourself on the carpet. Admit that you were in over your head, correct yourself, and turn the reigns over to God. Whenever you can do that you have strength under control. In other words, gentleness can get through to a hard head! We all have the tendency to mirror the image that is presented to us. For instance, have you ever found yourself in an argument and someone raises their voice at you and before you know it you’re raising yours to match theirs? Of course you have. We all have. There is a science to this. Energy, whether negative or positive, is transferrable. If you’re not careful you can become susceptible to being caught up into something you never intended to be in. We’ve all been there. We’ve said or done hurtful things out of the adrenaline to win the fight or out of retaliation to avenge yourself; yet you end up regretting over half of it if not all of it after its said and done. This is the significance of embracing the principle of gentleness. It’s being able to resist the default reactions that only escalates conflicts. If you’re abrasive, you’re not persuasive. If you have the ability to talk gently and remain calm in the midst of raging chaos, you have the key to unlock any door that belongs to you. When you have gentleness, you then have persuasive power. 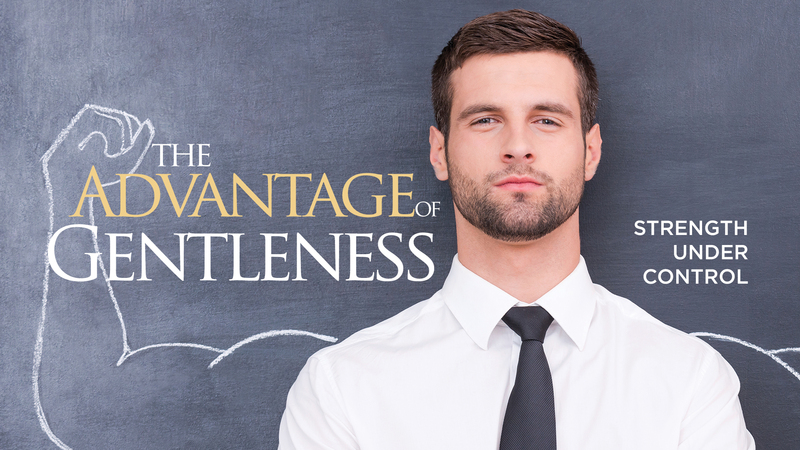 There’s so much more that I will share with you in this month’s partner, The Advantage of Gentleness. When you embrace the principle of gentleness, you can embrace the promise of your inheritance.